Airgunning is one of the most popular types of shooting in the UK. Both professional and recreational shooters can take part. Airguns are favoured above other types of guns as they don't make as much noise, and ammunition is relatively cheap. Its ability to provide a solid introduction to shooting is another factor in its popularity. The British Association of Shooting and Conservation (BASC) oversees airgun shooting in the UK. For adults, the membership cost is £49. For juniors (aged under eighteen), the cost is £20. One big advantage of joining the BACS is their team of firearms experts, who can offer legal advice on all aspects of possessing and using firearms. There is a telephone helpline that has been set up in relation to this. You can join via the BASC website, or call the membership phoneline, which can be found on the website. Joining a club is one of the simplest ways to get started in airgunning. Health and safety guidelines require you to stick rigidly to specific target range, which is much easier to do if you're using a club's facilities (rather than your own). You can also use their equipment (although you'll might have to pay a bit extra for that). This is useful if you don't fancy buying your own airgun (which will may also require you to get a firearms license). Targets can come in different forms, but the most common are paper bullseye targets (this is usually the case in indoor environments) and more complicated 'field targets' (this is usually the case outdoors). The more dedicated airgunners tend to have targets in their back gardens so they can practice whenever they feel like it. These are usually less formal, and can be anything from paper bulleyes to baked bin tins! Safety is an essential part of using an airgun. Make sure that the gun isn't loaded when you pick it up. Don't carry your gun around while loaded, as you never know when it might accidentally go off. Likewise, don't point it unless you're actually intending to shoot a target, even if it's not loaded. When you're not using your airgun, make sure that it's not loaded. All of this advice might sound obvious, but you'd be surprised how many accidents happen as a result of people not realising that a gun was actually loaded. You should also be aware that it's illegal to carry an airgun in a public place without having a good reason, even if the gun isn't loaded. If your airgun is over 12ft. lbs. muzzle energy for rifles or 6ft. lbs. for pistols, you'll need to get a license to legally use it. Anything below this should be fine without a license. You can't legally possess or use an airgun if you've been sentenced to three or more months in prison. If the sentence was up to three years in length, you aren't allowed to use or possess an airgun in the five years following your release from prison. If your sentence was over three years long, you can't use or possess an airgun full stop. 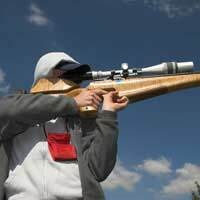 Airgunning is a good shooting sport to involve young people in, as it will teach them basics like safety, which will stand them in good stead for moving into other types of shooting sport.. As long as you're careful and stick to the common-sense health and safety guidelines, you should have no problems.